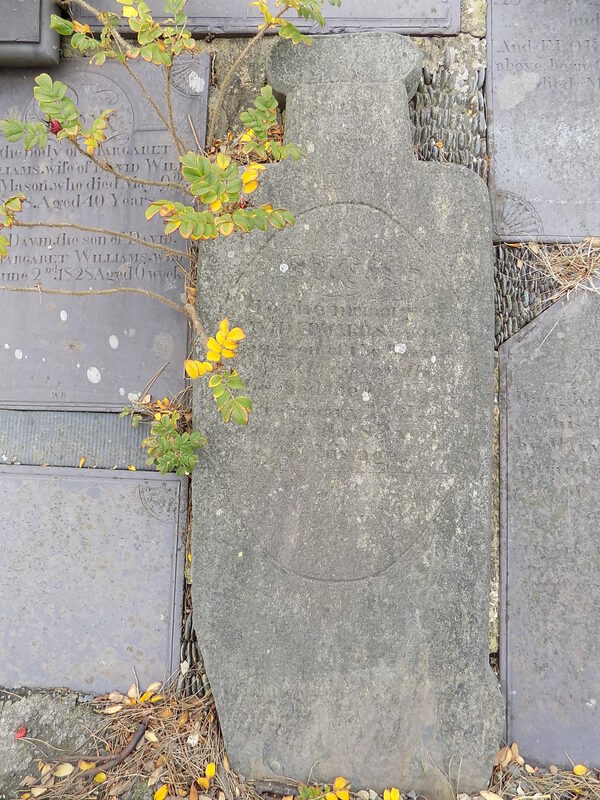 A bottle-shaped gravestone commemorates a nineteenth-century Aberystwyth doctor. Occupational emblems are quite common on medieval tomb carvings. Peter Ryder’s detailed studies of monuments from the north of England include horns, hammers and anvils, axes and musical instruments as well as the more common swords, shears and chalices. Modern tombstones are equally likely to illustrate hobbies and interests. A little memorial to Peter Williams (d. 1997) in St Mary’s Priory Church, Abergavenny, has golf clubs, a rugby ball, and his cat. 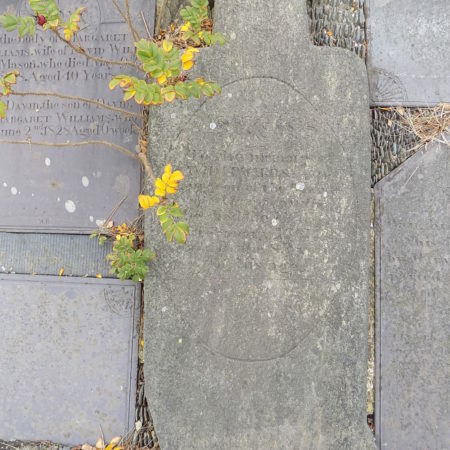 Peter Williams was one of the prime movers in raising funds for the conservation of Abergavenny’s spectacular collection of medieval tombs, and he was given the exceptional honour of the burial of his ashes inside the church. A headstone made entirely in the shape of an occupational emblem is more unusual. 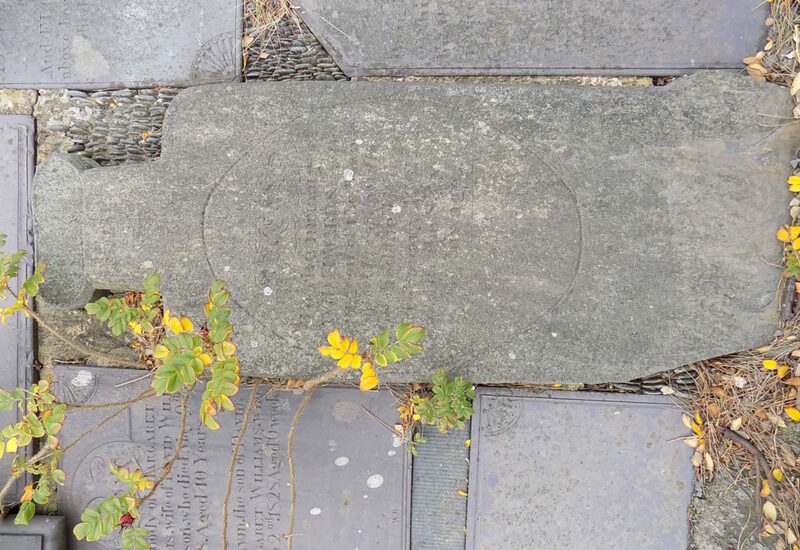 In the graveyard of St Michaels, Aberystwyth, now lying flat but presumably intended as a headstone, is this memorial to a local doctor. The whole stone is shaped like a medicine bottle. The National Library of Wales has given us the following information about Dr David Edwards. He was born in Lledrod (Cards.) in about 1776, to judge from the age on his death certificate. By 1830 he was living in Queen Street, Aberystwyth, where Pigot’s Directory described him as a surgeon. He was still in Queen Street at the time of his death in 1861. He does not seem to have married. His will left his nephew, Thomas Jones of Cilpill in Nancwnlle (Cards. ), as his main legatee and executor. Presumably it was Jones who commissioned the tombstone, and chose to represent his uncle by a medicine bottle rather than a surgical instrument!